This free utility automatically imports folders with files on your disk or network share into Outlook, keeping the original folder structure and provides additional features. To import documents, images, and other files from folders on your disk or network share to Outlook folders or Exchange Server Public Folders, specify the source folder, destination folder, and then run the utility. Recent Changes: New features and enhancements. Converts Outlook email to PDF with attachments and downloading external images. 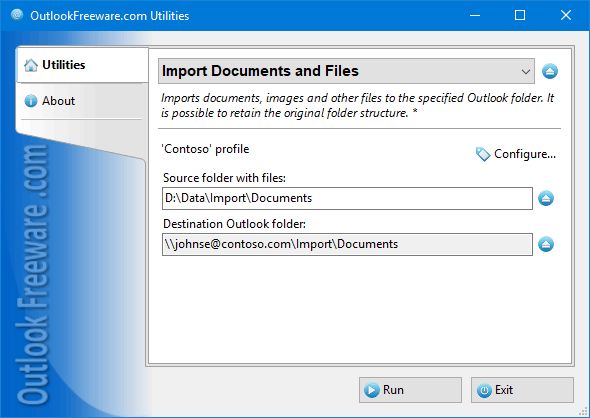 Imports documents, images and other files to the specified Outlook folder.